The Eight of Pentacles in a Tarot reading indicates a relationship with someone who is highly skilled and has a keen interest in spirituality, the occult and the unusual. They may not want a traditional relationship and it comes with a warning not to be led astray. In the reversed position it can mean there is a danger of lending your other half any money and the skill maybe about animal cunning! A young man in business who has relations with the Querent; a dark girl. The Querent will be compromised in a matter of money-lending. 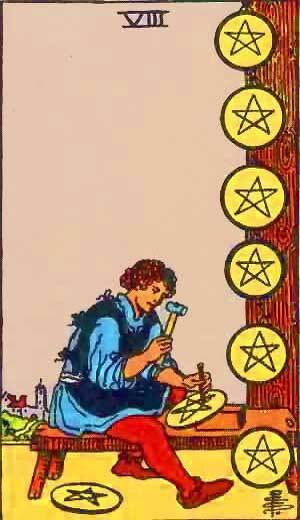 Eight of Pentacles – A dark Girl, Beauty, Candour, Chastity, Innocence, Modesty. A dark girl, honest girl. Reversed: usury, voided ambitions, vanity, cupidity, avarice. Waite says: “Work, employment, commission, craftsmanship, skill in craft and business.” Another version has also: abundance, hospitality, politeness, kind reception, majority, augmentation, etc. It is the Fire on the Twelfth house. This has not much to do with useful work directly, nor with employment, but very much with skill and ingenuity, genial finding-out of the nature of things, so ‘craftsmanship’ may stand. For the rest, it is the house of offering, devotion, self-undoing, imprisonment and treason. The combination of the fire of the heart with it produces very different effects. Above all it gives skill and bravery, far above the average, outdoing the commonplace, neglecting fashion, sinning against tradition but widening the views and outlook. Dexterity will ensue from it. In matters of the heart it always tends to the unusual, superhuman, exotic, wayward, strange or dreamy. The illustration of the card is to be taken more as a warning against the dangers of this house than as a direct descriptive image of its nature; as a sort of hint: keep to your work, do not let yourself be led astray or misguided. It is also the house of the sick, the hospital and the addiction of ‘hospitality’ may well allude to this fact. Charity comes under it. That ambitions are wrecked in this house is correct in general, still the pentacles are never strong in any evil sense, and they are apt to wreck fortunes or bubble reputations rather than ambitions. With ‘avarice’ it has nothing to do whatever, as far as we can see. The ‘dark girl’ is another question: apart from the court-cards the ace is very often taken to indicate a boy or youth, the eight a girl. The cups are generally taken to denote fair people, the pentacles dark people. Apart from this Eteilla makes the cards of wands–ace to ten–stand for young people, from one to twenty years of age. The reason for this we have not found out. If the eight always indicates a girl (which may be so because the eight always falls upon a house of water, which is entirely feminine in its nature), and the fiery pentacles must relate to dark-haired or even dark-skinned people, then the indication is right, and we shall accept it as far as it goes. The symbol of Mercury on the cube refers to the Sphere of Mercury. The first decanate of Virgo, under the rulership of Mercury, from August 23rd to September 1st. Skill in the management of material affairs; industry; gain in subordinate positions, through writings, clerical work or travel; gain of ready money in small sums. This card signifies avarice and hoarding; penny wisdom and pound foolishness; meanness in money matters; loss through travel or writings; the Querant is likely to be in difficulties with superiors and also with inferiors; he may lose through trying to overreach somebody else. More information on the Eight of Pentacles Tarot card. This entry was posted in Tarot, Runes and Divination and tagged addiction, dark woman, eight of pentacles, feelings, heart, love, mercury, money, tarot, wisdom. Bookmark the permalink.